An adviser to Egypt’s military rulers said in a newspaper interview published on Thursday that a brutal attack on a female protester by Egyptian soldiers on Saturday was justified because the woman had insulted the army. Thousands of Egyptian women took to the streets of Cairo this week to protest the beating of the woman, whose black abaya was stripped back to reveal her underwear during the attack. Asked about video and photographs of soldiers hitting and kicking the woman, Gen. Abdel Moneim Kato, a retired officer who advises the ruling military council in Cairo, told the Arabic-language newspaper Asharq Al-Awsat that the female activist “had been insulting the army through a megaphone” before she was stripped and beaten. That justification for the brutal beating comes eight months after the generals put in power by President Hosni Mubarak sentenced another activist, Maikel Nabil, to three years in prison for “insulting the armed forces” on Facebook. According to an English-language summary of the general’s comments published by The Egypt Independent, a Cairo daily, the adviser also defended the use of live ammunition against protesters, which he claimed was permitted by the terms of the Geneva Conventions. But, as another retired general told The Independent, the conventions that govern the rules of war between states or militias contain no such provision permitting attacks on civilian protesters. General Kato — who called protesters delinquents “who deserve to be thrown into Hitler’s ovens” in another interview this week — also claimed that activists calling for an end to military rule were agents of foreign governments who had paid children to attack soldiers. While the woman whose beating sparked such outrage has yet to speak publicly, a woman who attempted to come to her aid, and was then pummeled by soldiers herself, spoke to CNN from her hospital bed on Thursday. Another female activist gave this account of the beating and sexual assault she endured on Saturday after she was captured by soldiers to Mosireen, a Cairo film collective. Since Egyptians without access to the Internet or satellite television might not have seen the video of the attack on the women, and on other protesters, activists took to the streets of Cairo with portable projectors to screen the footage on Thursday. The activist and blogger Lilian Wagdy reported that supporters of the army had tried to stop one such screening by destroying the projector, which sparked an impromptu protest march in the Cairo district of Heliopolis. 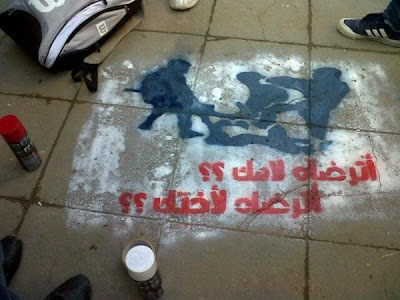 Some of the activists also painted graffiti images of the attack on the pavement and asked Egyptians to consider whether they would accept such an assault if the victim was their mother.